The Brooklyn Nets officially released their new uniforms for the upcoming season Friday night at the Barclays Center, and they should come as no shock to fans. 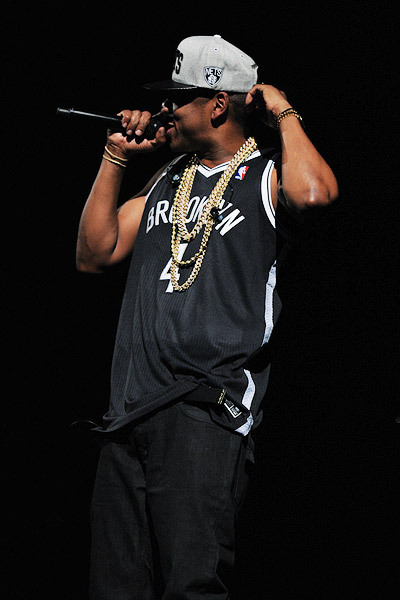 Superstar rap icon and Nets minority owner Jay-Z unveiled the black and white duds at his sold-out show in the brand-new Brooklyn arena—new city, new arena, new team, new jerseys. Gone are the days of the red, white and blue, which the team sported in the ABA as the New York Nets and later in the NBA while playing in New Jersey. In their place, a serious, classic design of simple black and white. Not flashy. Not over the top. But simple, and the perfect tone-setter for New York's newest team. They are certainly a big improvement over some of the jerseys the franchise sported in New Jersey. The team will wear a traditional white jersey at home—Brooklyn across the front in black letters—with black trim. On the road, the jersey will be black—Brooklyn in white print across the front—with black trim. These are virtually identical to the jerseys that were leaked out across the Internet last week. They are part of a concerted effort to establish the Nets in Brooklyn with a brand-new identity and leave the past behind. The Nets open up their inaugural season in Brooklyn on Nov. 1 at the Barclays Center against the rival New York Knicks.